The water line not needed for the restroom not wanted has made it to the top of East Cemetery Hill. 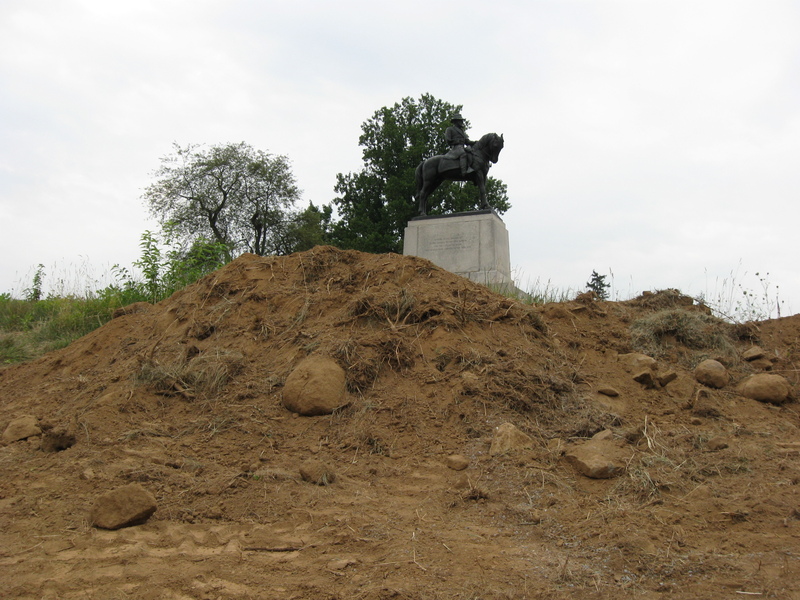 The equestrian statue of Major General Oliver Otis Howard is in the background. This view was taken facing southwest at approximately 8:00 AM on Sunday, August 1, 2010. 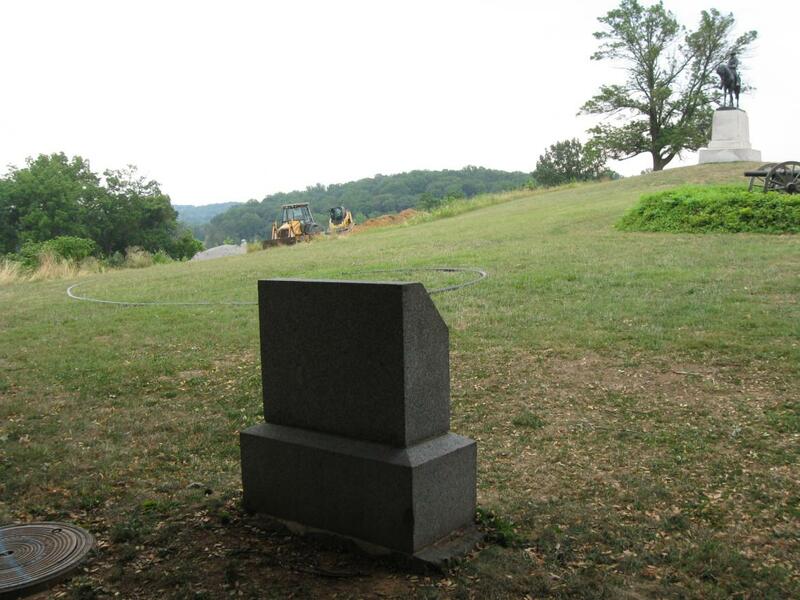 National Park Service contractors have worked for approximately four weeks to bring water to the Spangler’s Spring restroom from East Cemetery Hill. The water line has now reached the top of East Cemetery Hill. 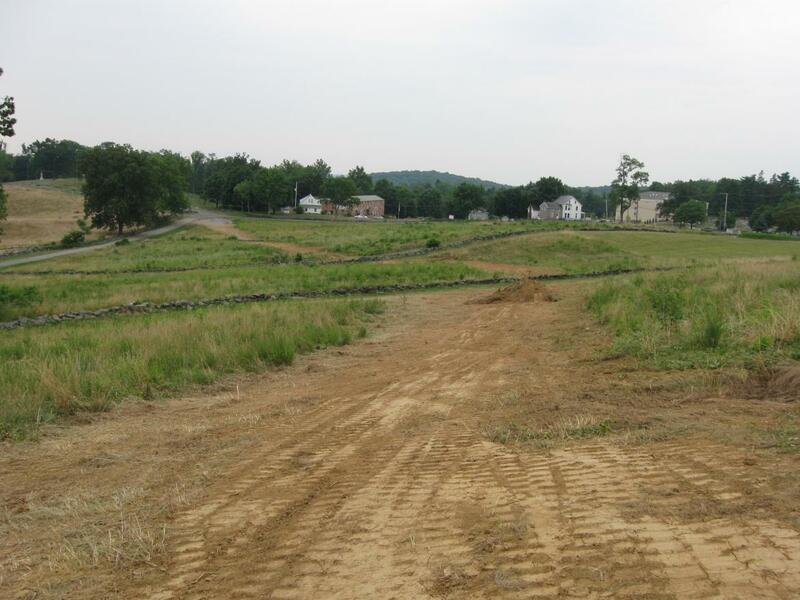 It is certainly not difficult to follow the path of the water line from Stevens Knoll/McKnight’s Hill on the left to East Cemetery Hill where the camera is located. Powers Hill is in the center background. The McKnight House is the stone structure with a white addition in the right background, and our favorite Comfort Inn overlooking the Evergreen Cemetery is to the right of the McKnight House. This view was taken facing southeast at approximately 8:00 AM on Sunday, August 1, 2010. 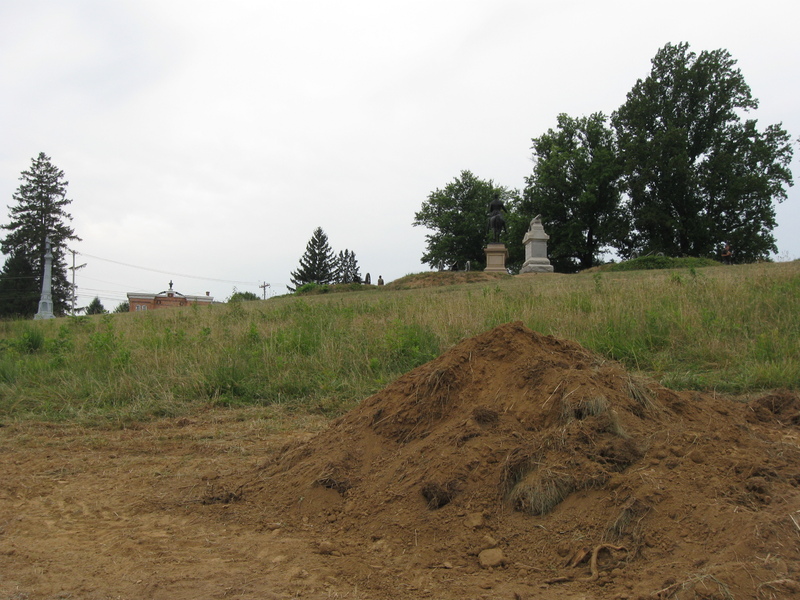 North Carolinians broke a United States’ line at the bottom of the hill, and charged up East Cemetery Hill in this area the evening of July 2, 1863. 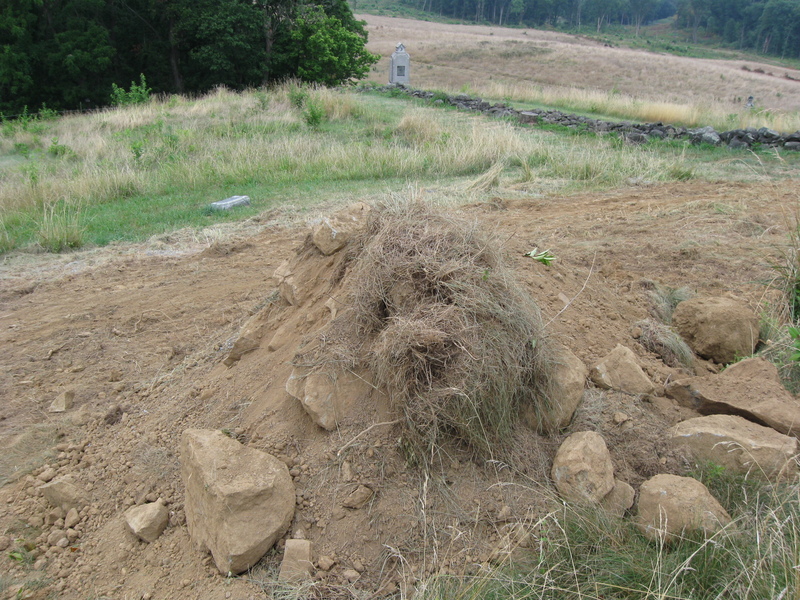 Some of them made it into the Union artillery pieces at the top of the hill. This view was taken facing southwest at approximately 8:00 AM on Sunday, August 1, 2010. 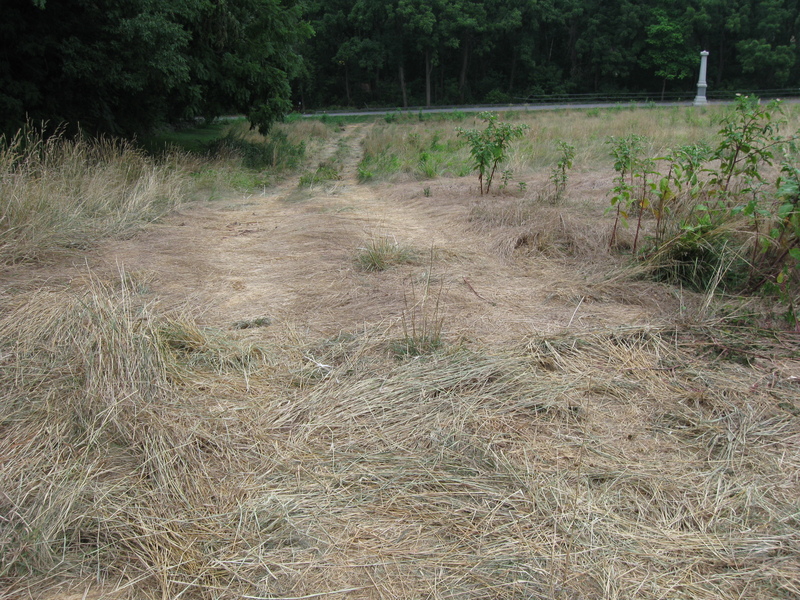 The National Park Service does not consider this work to be disturbing the historic resource as a water line had previously been placed in this area in 1937. Looks like a lot of work to bring water to four toilets and two sinks that nobody has cared about using for over eight years. This view was taken facing southeast at approximately 8:00 AM on Sunday, August 1, 2010. 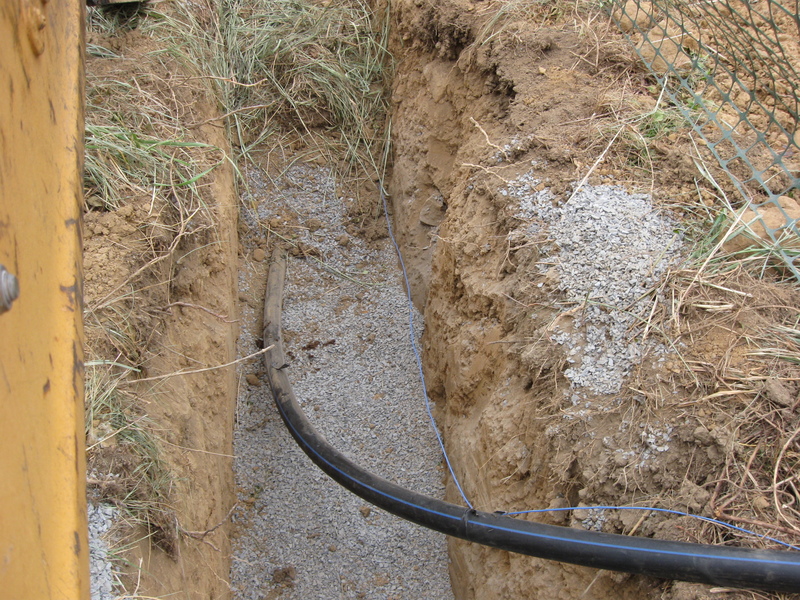 In 1937, when the previous water line was dug, hand tools were used to dig the one foot wide trench. Today modern equipment is used to not disturb the resource. Culp’s Hill is in the left background. This view was taken facing southeast at approximately 8:00 AM on Sunday, August 1, 2010. We have been pleased that as the water line approaches the original rock walls that the contractor has vandalized with spray paint, and that the recent rains have not washed away, that they are running the water line under the walls. This view was taken facing southeast at approximately 8:00 AM on Sunday, August 1, 2010. They are using the pipe from the 1937 water line to thread the new pipe through to the other side, saving the ground and the stone walls. This view was taken facing northwest at approximately 8:00 AM on Sunday, August 1, 2010. 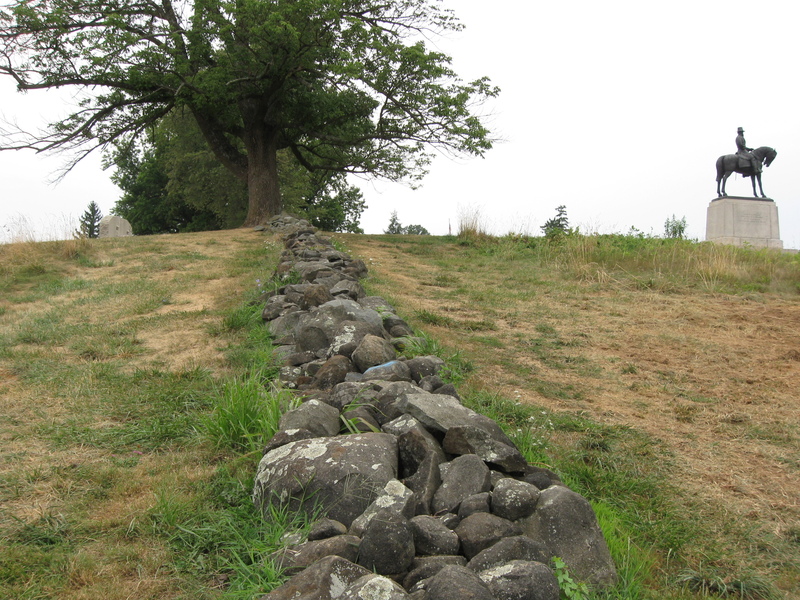 This stone wall upon which Colonel Charles Wainwright, the commander of the Artillery of the First Corps of the Army of the Potomac, sat while watching his men duel with Confederate artillery on Benner’s Hill on the afternoon of July 2, 1863, has been saved. The ground on both sides of the wall has been saved. More than a few of our readers have asked us this, and we’ll ask it as well. 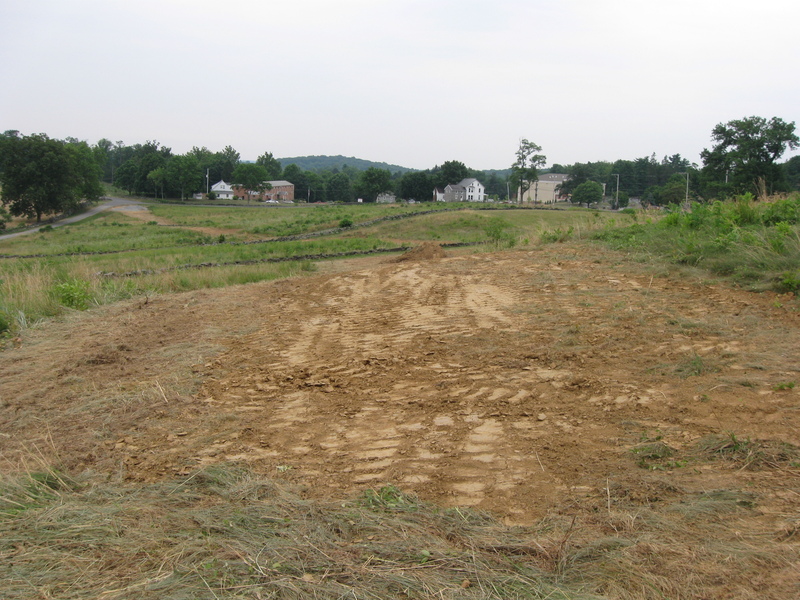 Why couldn’t this have been accomplished more frequently during this project to better protect the resource? 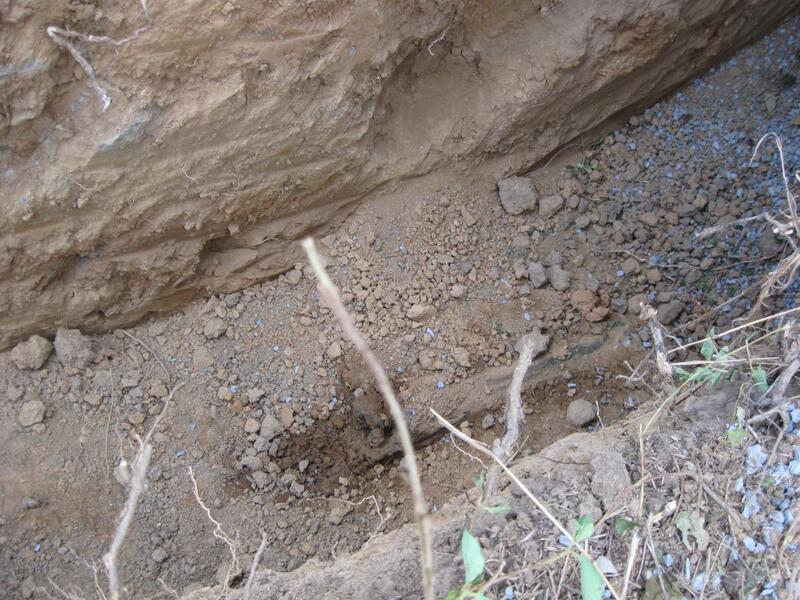 The old pipe is supposedly still there from East Cemetery Hill to Spangler’s Spring. We’re sure it’s a question of cost, so we hope that the next time that the National Park Service decides to contract out another wasteful project of this magnitude ($295,767), that they figure into the cost the use of existing features. This view was taken facing southwest at approximately 8:00 AM on Sunday, August 1, 2010. 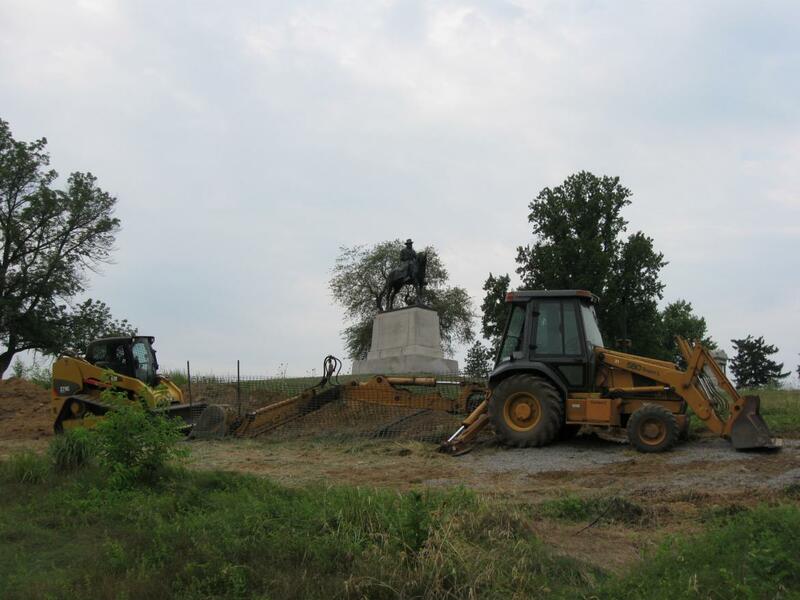 Just another example of the National Park Service and its contractors not disturbing the historic resource. The monument at the bottom of the hill is to the 54th New York Infantry Regiment. 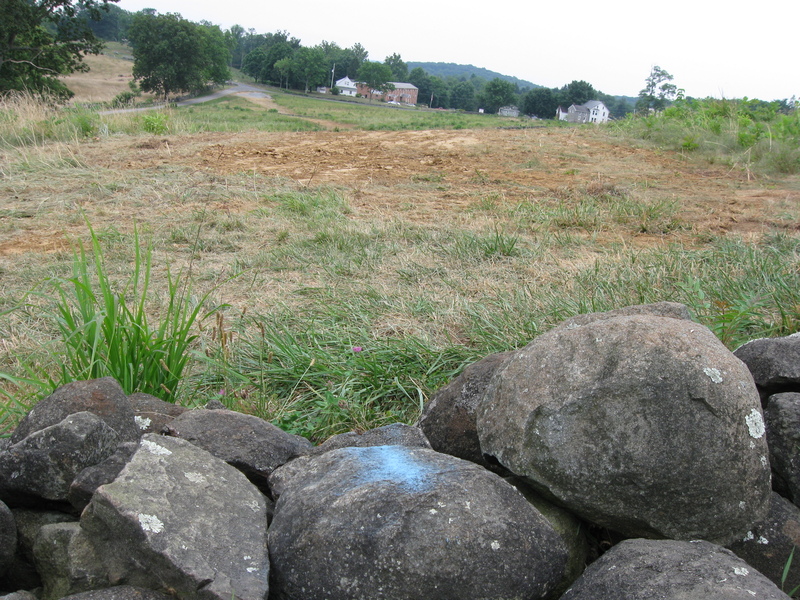 The light colored stone in the grass is the advance marker for the 7th West Virginia Infantry Regiment as they counterattacked the Confederates and drove them down the hill the evening of July 2, 1863. It used to be difficult to find the marker because sometimes it was overgrown. It looks like we won’t have to worry about that for a while. This view was taken facing east at approximately 8:00 AM on Sunday, August 1, 2010. Here’s the pathway the contractors have created from Wainwright Avenue to the top of East Cemetery Hill to bring up their equipment. The monument to the 17th Connecticut Infantry Regiment is in the right background on Wainwright Avenue. This view was taken facing northeast at approximately 8:00 AM on Sunday, August 1, 2010. 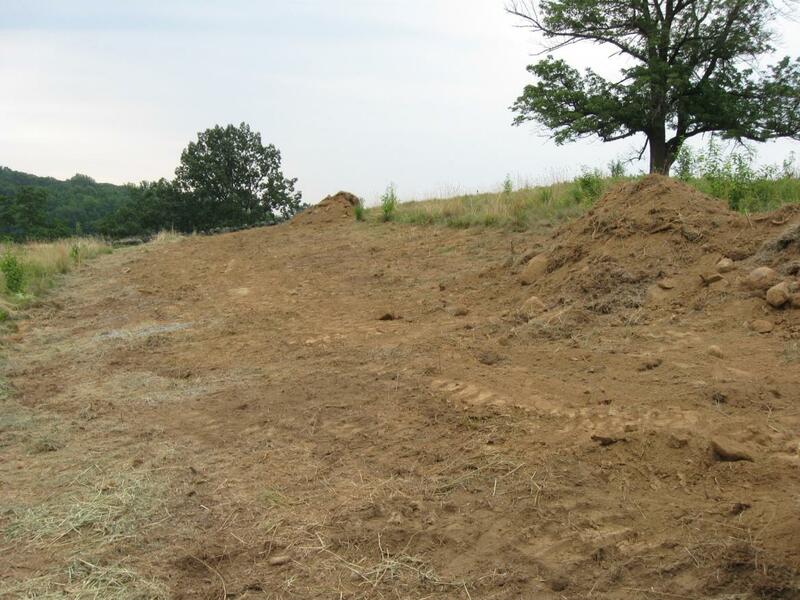 Here is the equipment used for placing the water line as of last weekend. The Howard equestrian statue is in the background. This view was taken facing southwest at approximately 8:00 AM on Sunday, August 1, 2010. Visible here is some of the 1937 pipe which the contractor is not running the new pipe through, probably because they are not pressured to save rock walls in this location. It’s just dirt, right? This view was taken facing northwest at approximately 8:00 AM on Sunday, August 1, 2010. So they are digging down to the level of the old pipe, and laying the new water line on top of it. This view was taken facing southeast at approximately 8:00 AM on Sunday, August 1, 2010. The water line is making its final approach to the water main just to the left of the 106th Pennsylvania Infantry marker. The Howard Equestrian Statue is in the right background. Culp’s Hill is in the background above the equipment. 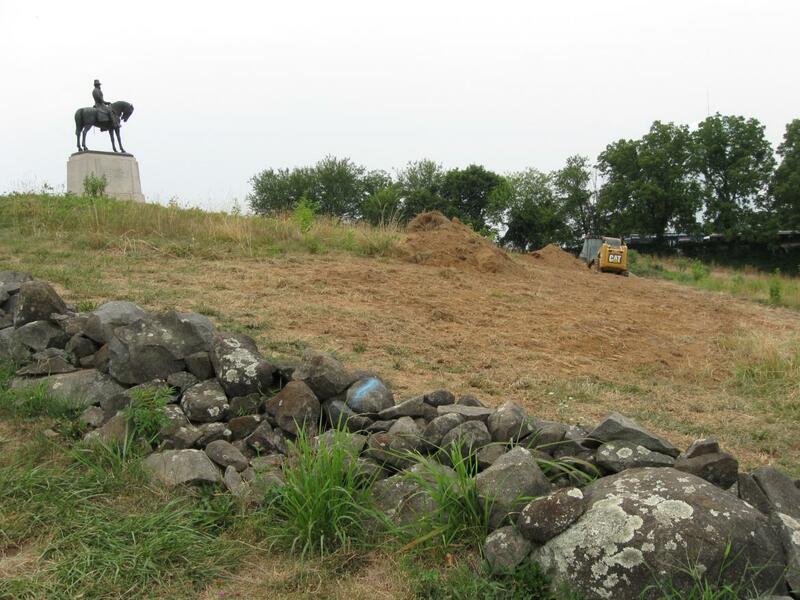 On the right is one of the artillery pieces marking the position of Weidrich’s New York Battery. This view was taken facing southeast at approximately 8:00 AM on Sunday, August 1, 2010.